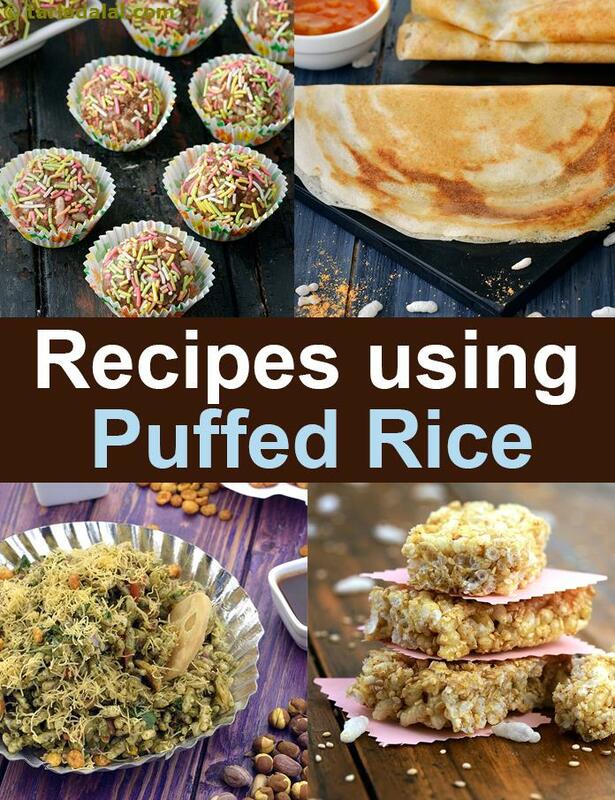 puffed rice recipe collection. indian mamra recipes. Puffed Rice or more commonly known as mumra or kurmura, is rice that has been steamed under high pressure so that it puffs up, ie fills up with air. Even though abroad it is used in sweet treats or as a cereal coated with sugar, in India it is used more in savory dishes, especially street food like bhel. It is crispy and slightly chewy at the same time. Not only bhel, Indians also use it to make sweets for traditional occasions. Bhel Puri is one of the most renowned snacks in Mumbai and is sold street side. It is tangy, spicy, fresh and super easy to make! The bhaiyyas that sell them add chatpata chaat masala, tomatoes, onions, papdi, sev, different chutneys and coriander. Depending on how one likes it, there are two types. Dry or Sukha bhel is more on the drier side with less chutneys, while Geela Bhel has more of chutneys and spices, though both of them are equally mouthwatering. A simple yet satiating snack is Sev murmura which is a little similar to bhel but only has puffed rice, sev and flavored with turmeric and chilli powder. Kolhapuri Bhadang Murmura is a crispy Maharashtrian jar snack that is sautéed in garlic, peanuts and just a tiny bit of sugar. This snack has a brilliant aroma and tempts anyone who comes near it. As mentioned before, puffed rice is used to make sweet preparations in India. Chikki, a common preparation of jaggery with other ingredients – sesame seeds, peanuts or dry fruits and dried to make sweet bars. Chikki is also made with puffed rice! The puffy rice gives a crunchy texture to this delicious Kurmura Chikki which is served on occasions like Makar Sankranti and Diwali. A very similar preparation of Puffed Rice and Sesame Bars is something I grew up with. The snack is laden with sugary goodness that no kid will say no to. Dosa is a preparation traditionally made of rice and urad dal but it can also be made with puffed rice. Benne Dosa, a puffed rice dosa, has a spongy and crispy texture, both at the same time. With the addition of rice and urad dal with this, we get a batter that makes an irresistible dosa. Variations of bhel like Maggi Bhel and Oats bhel are as unique as they come. Puffed rice can also be used to amazing Crispy Chocolate Balls. These balls can be given as a birthday treat or a Diwali sweet and will definitely impress the eater! Enjoy our collection of Puffed Rice Recipes. Dosa has put south india on every culinary hot spot of the world. Served traditionally with sambhar and chutney. Very quick and easy to make dosa. Want to eat chat-pata? Try this new version of bhel. Your energy and protein requirements shoot up during the second trimester and also you may sometimes feel like munching on a snack. This is an excellent snack with a good combination of sprouts and fruits providing you with vitamins and fibre. Cashew and peanut chikkis are passé! go for more interesting yet healthy options like these puffed rice chikkis. Do not overcook the jaggery or the kurmure ki chikki might end up hard. Easy and quick snack for your guests. . .
Cut the afternoon cravings with this very simple and healthy snack. You can change the spices to suit your taste.